Kenenisa Bekele is an Ethiopian long distance runner, who along with country man Haile Gebrselassie, are regarded as one of the greatest long-distance runners of all time. He has held both the Olympic and World Records at the 5,000m and 10,000m distances. He has 3 Gold medals and 1 Silver which he has won in these two events during the 2004 and 2008 Olympics. He is also the greatest cross-country runner ever with a total of 6 long course (12 kms) and 5 short course (4 kms) titles in the IAAF World Cross Country Championships. He has won the 10,000m in World Championships four consecutive times in 2003, 2005, 2007 and 2009. 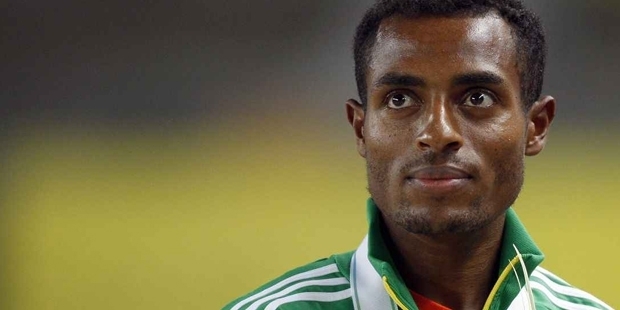 Bekele was born on June 13, 1982 at Oromia Region, Ethiopia. He did not take running seriously until he saw his countryman Haile Gebrselassie winning titles on the big stage. This gave Bekele the confidence that he could also achieve great things, inspite of not having proper training facilities or guidance. His interest picked up in running and soon he was being touted as one of the upcoming running stars in Ethiopia. He first tasted success in the year 2001, when he set a new World Record at the Junior World Championships in Brussels with a time of 7:30.67. He was able to win both the short and long course events at the IAAF World Cross Country Championships in 2002. He went on to repeat this feat for another four times in a row. This feat of a double victory has not been achieved by a single person in the history of cross-country racing. And here was a boy from Ethiopia who went on win the double title for an astonishing 5 times in a row. He went on to win the 10,000m at the 2004 Athens Olympics comfortably but had to settle for the Silver in the 5,000m. His dominance had shown the world, that athletes from under developed countries like Ethiopia could dominate sporting events on the international stage. In August 2005, he set the 10,000m World Record with a time of 26:17.53. That year he also won the World Outdoor Championships at Helsinki. In 2006, he created history when he won the 3,000m at the IAAF World Indoor Championships. Now he had become the only athlete in history to be holding the title of Olympic champion, World cross country champion, World indoor track champion and World outdoor track champion at the same time. By 2007, he had registered a winning streak of 27 consecutive races in Cross Country racing starting way back in 2001. At the 2008 Beijing Olympics, Bekele was able to win his favorite 10,000m title with an Olympic record of 27:01.17. He also went on to win the 5,000m Gold medal this time, becoming only the sixth person in history to win both the 5,000m and the 10,000m at the same Olympics. He won both the 5,000m / 10,000m events at the 2009 World Championships, making him the first athlete to do at the World Championships. From his debut in 2003 to 2011, he was unbeaten in the 10,000m distance. He has been one of the most successful distance runners of all time with a huge collection of World Records and medals. He will be remembered for his utter dominance and consistency on the running track in the years to come.